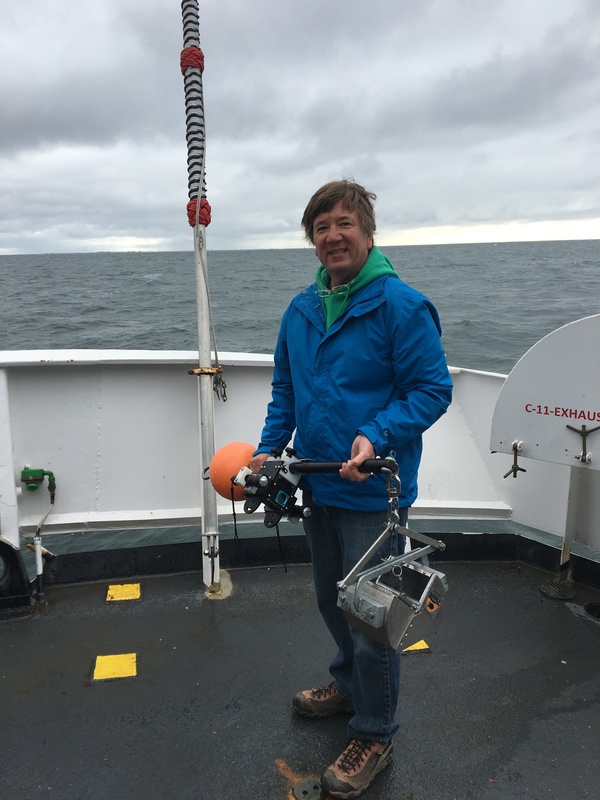 Today we deployed the drifter buoy off the stern of the Fairweather off the southeast coast of Kodiak Island Alaska, at 3:30 pm Alaskan time zone. 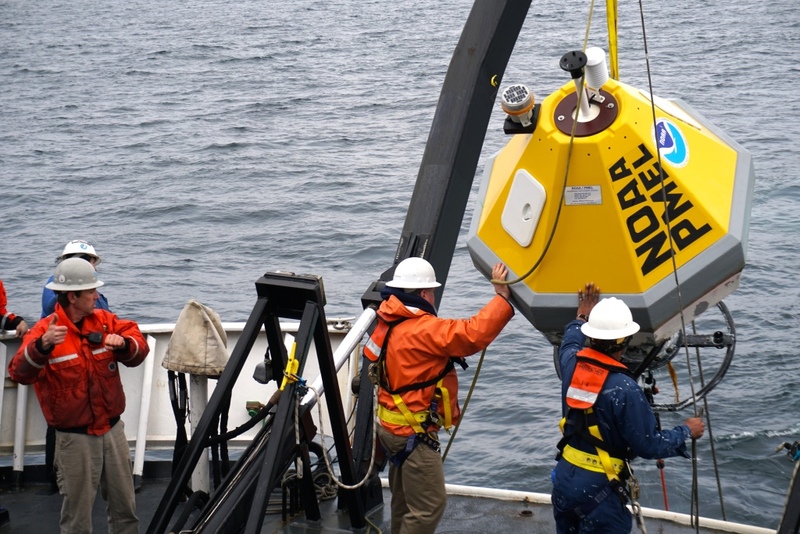 The buoy will be transmitting its location for approximately one year. During this time, students will be have the opportunity to logon and track its progress. This project is very exciting for many of my students at the Henderson County Early College and elementary students at Atkinson Elementary (Mills River, NC) and Hillandale Elementary (Henderson County, NC) that have participated in my “Young Scientists” program. Prior to my journey to Alaska, I visited those elementary schools introducing them to the mapping that we were going to collect and the important mission of NOAA. As part of this outreach, students designed stickers that I placed on the buoy prior to deployment yesterday. In addition, Ms. Sarah Hills, a middle school science teacher from the country of Turkey, is also going to track its progress. An interesting note: my “Young Scientists” program was inspired in 2015 after participating in my first Teacher at Sea trip on board NOAA Ship Henry Bigelow. I would like to thank the NOAA Teacher at Sea Alumni coordinator Jenn Annetta and Emily Susko for supporting this effort! All schools are welcome to track its current location. Visit the following site http://osmc.noaa.gov/Monitor/OSMC/OSMC.html. In the upper left hand corner enter the WMO ID# 2101601 and then click the refresh map in the right hand corner. 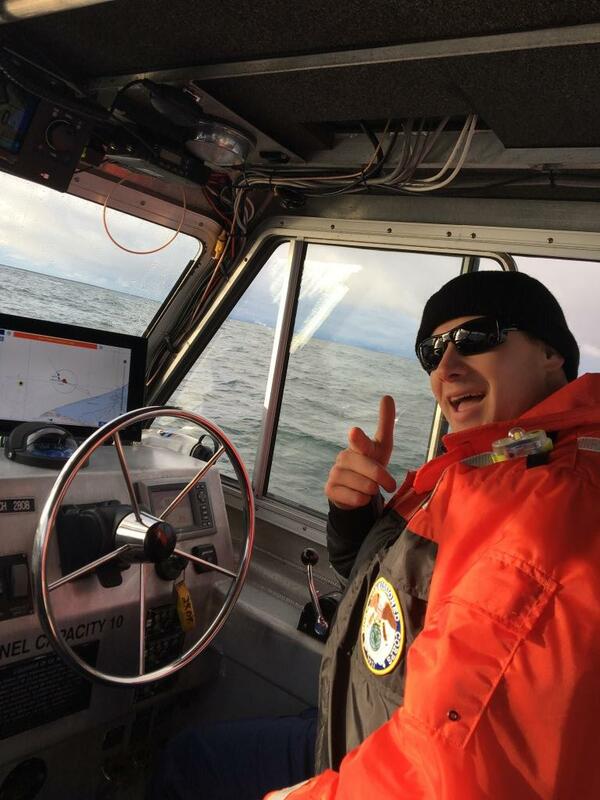 The last day at sea, crew members had the opportunity to fish from the ship in a region called the “Eight Ball,” which is a shoal just of to the southwest of Kodiak Island. 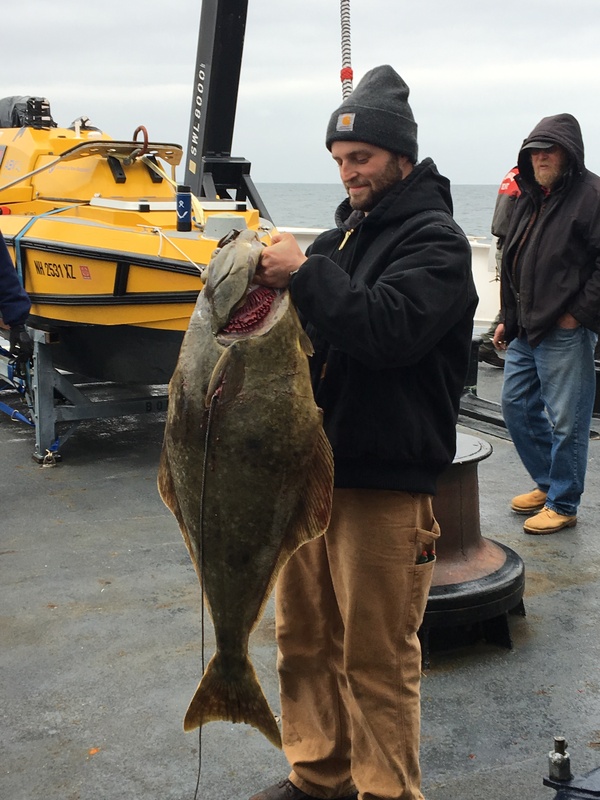 Within ten minutes, the reels were active hauling in Halibut. I have never seen fish this big before and Eric reeled in the biggest catch weighing around 50 lbs! Alaska is a big state with big fish! This is my last day on board the Fairweather. 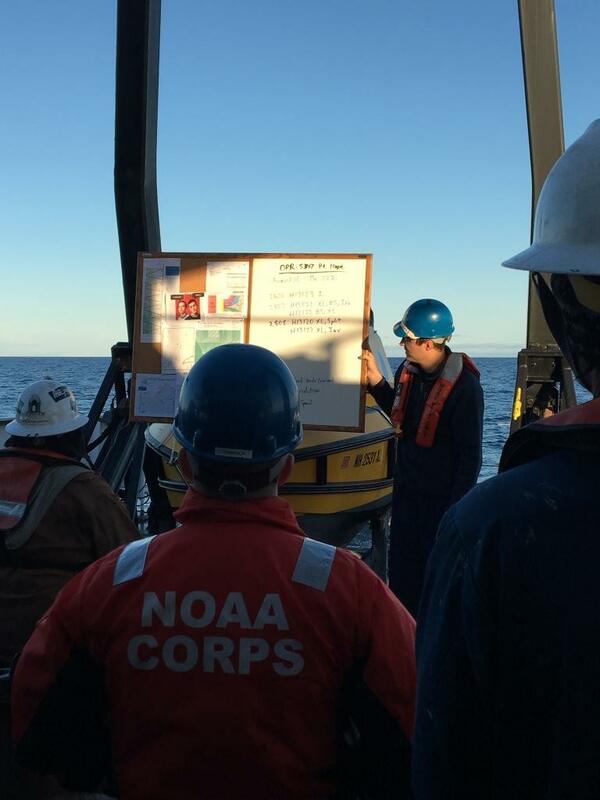 For three weeks I witnessed a young NOAA Corps crew orchestrate an amazing level of professionalism and responsibilities to ensure a productive mission. While on board and I met new friends and I have learned so much and will be bringing home new lessons and activities for years to come. The crew on board the ship has been very warm, patient and very happy to help answer questions. I am very honored to be selected for a second cruise and have enjoyed every minute; thank you so much! 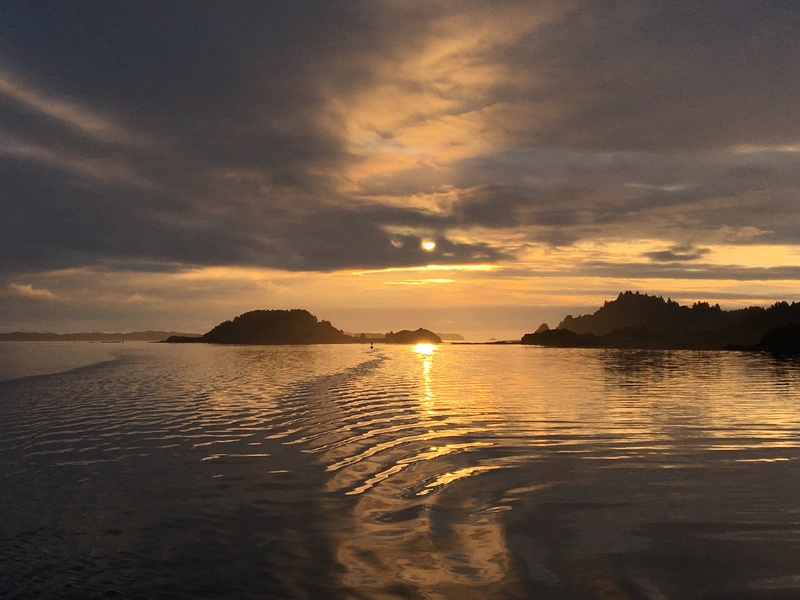 As we sailed into Kodiak Island, witnessed an eye catching sunrise, wow! I wish the crew of the Fairweather, Fair winds and happy seas. I was asked yesterday by one of my students what life is like aboard the NOAA Ship Fairweather? So I thought I would dedicate this entry to address this and some of the other commonly asked questions from my students. Life on board the ship is best described as a working village and everyone on board has many specific jobs to ensure the success of its mission; check my “Meet the Crew” blog. The ship operates in a twenty four hour schedule with the officers rotating shifts and responsibilities. 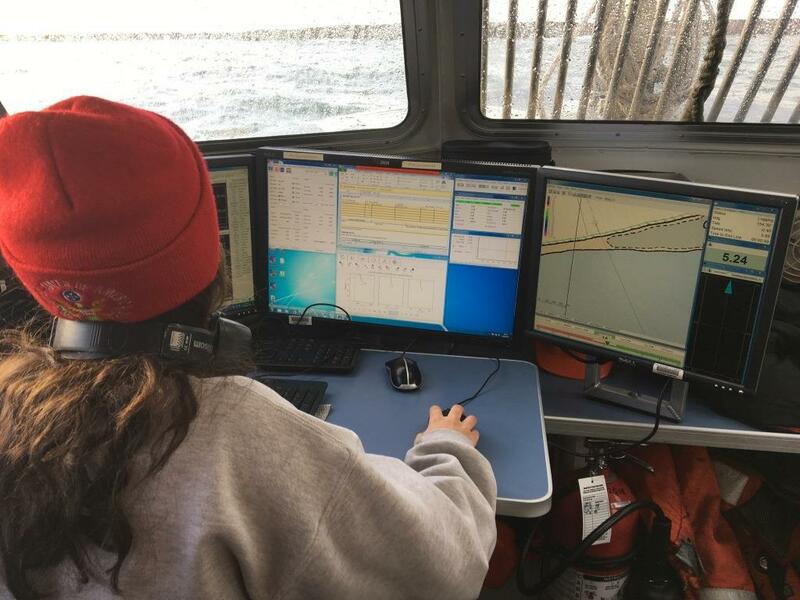 When the ship is collecting ocean floor data, the hydrographers will work rotating shifts 24 hours a day. With so much happening at once on a working research vessel, prevention of incidents is priority which leads to the ship’s success. A safety department head meeting is held daily by the XO (executive officer of the ship) to review any safety issues. (Fun fact: at sea, ships use signal flags to communicate messages back and forth [obviously, this was more prevalent before the advent of radio]. For example: the “A” or “Alpha” flag means divers are working under the surface; the “B” or “Bravo” flag means I am taking on dangerous cargo [i.e. fueling]; and the “O” flag means I have a man overboard. The phonetic name for “O” is, you guessed it, “Oscar” … hence the name. You can read about other messages here: https://en.wikipedia.org/wiki/International_maritime_signal_flags). Precision and speed is the goal and it is not easy when the officer is maneuvering 1,591 tons of steel; the best time was 6:24. 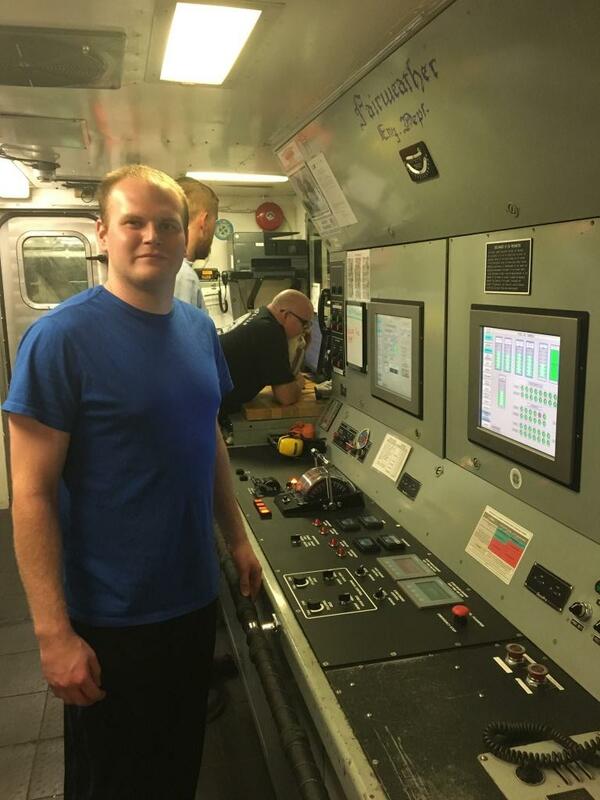 This takes a lot skill, practice and the ability to communicate effectively to the many crew members on the bridge, stern (back of boat), and the breezeways on both port and starboard sides of the ship. Navigating the ship becomes even more challenging when fog rolls in as the officers rely on their navigation instruments. Training can also come in the form of good entertainment. 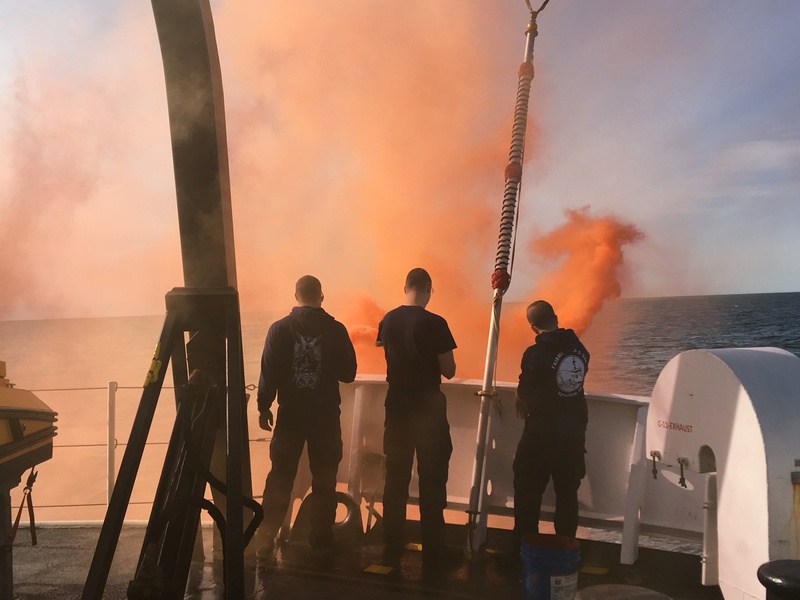 With expired rescue flares and smoke grenades, the whole crew practiced firing flares and activating the smoke canisters. These devices are used to send distress signals in the event of a major ship emergency. I had the opportunity of firing one of the flares ! What are the working conditions like on board? At sea, the working environment constantly changes due to the weather and the current state of the seas. Being flexible and adaptive is important and jobs and tasks for the day often change Yesterday, we experienced the first rough day at sea with wave heights close to ten feet. Walking up a flight of stairs takes a bit more dexterity and getting used to. At times the floor beneath will become not trustworthy, and the walls become your support in preventing accidents. 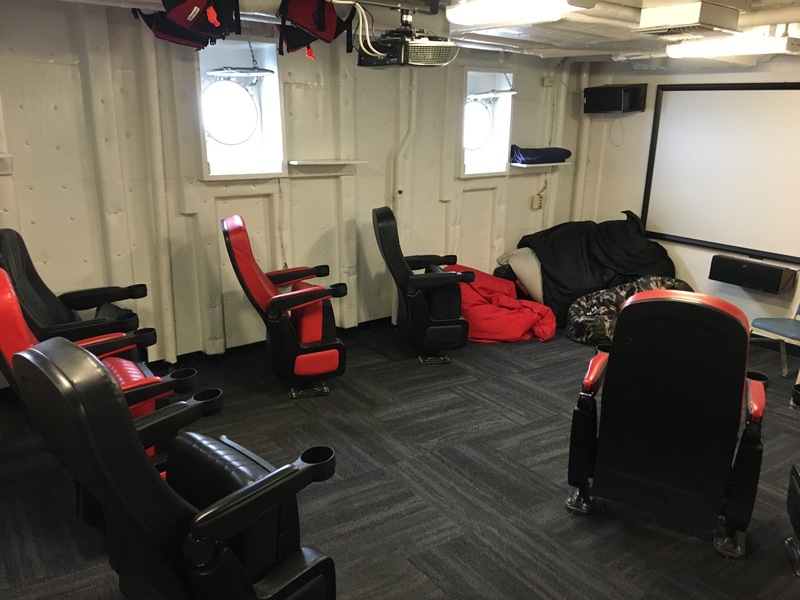 Each crew member is assigned a stateroom and some are shared quarters. 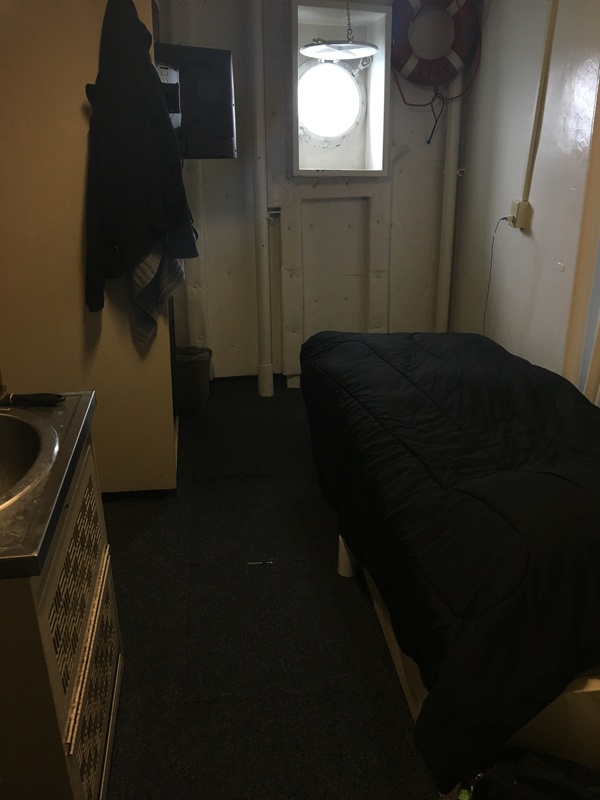 Each stateroom has the comforts from home a bed, desk, head (bathroom & shower) sink and a port hole (window) in most cases. The most challenging component of sleeping is sunlight, it does not set until 11:30 pm. No worries, the “port holes” have a metal plate that can be lowered. It is definitely interesting looking through the window when the seas are rough and watching the waves spin by. Seabirds will occasionally fly by late at night and I wonder why are they so far out to sea ? Generally, when sharing a stateroom, roommates will have different working shifts. Meals are served in the galley and it is amazing! It is prepared daily by our Chief Steward Tyrone; he worked for the Navy for 20 years and comes with a lot of skills and talents ! When asking the crew what they enjoy the most on board the ship, a lot of them mention the great food and not having to cook. 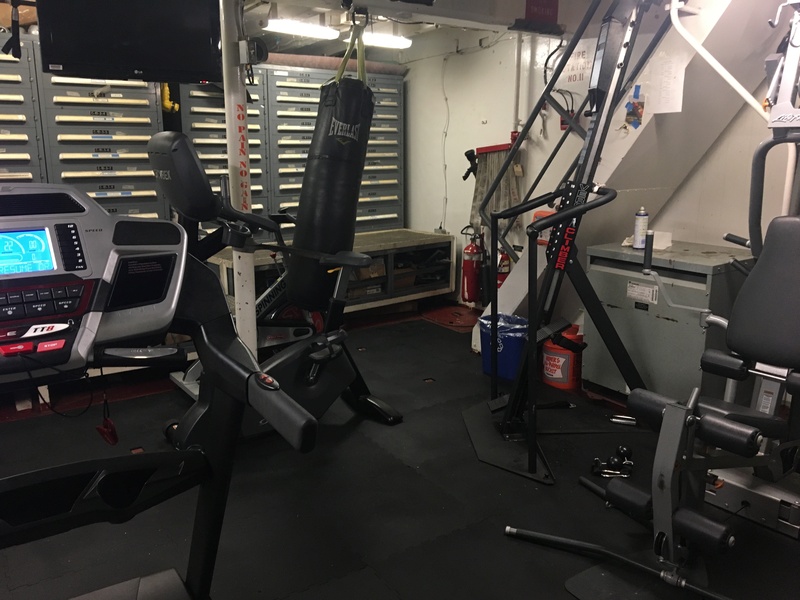 Keeping in good physical shape aboard any vessel out at sea is important. The Fairweather has a gym that can be used 24 hours a day. The gym has treadmills, elliptical, weights and a stair climber. There is the lounge where movies are shown in the evening. Interestingly, the seats glide with the motions of the waves. Meetings are also held here daily, mostly safety briefings. During any cruise with NOAA, there is always things that come up that were not planned, staff and schedules are adjusted accordingly. 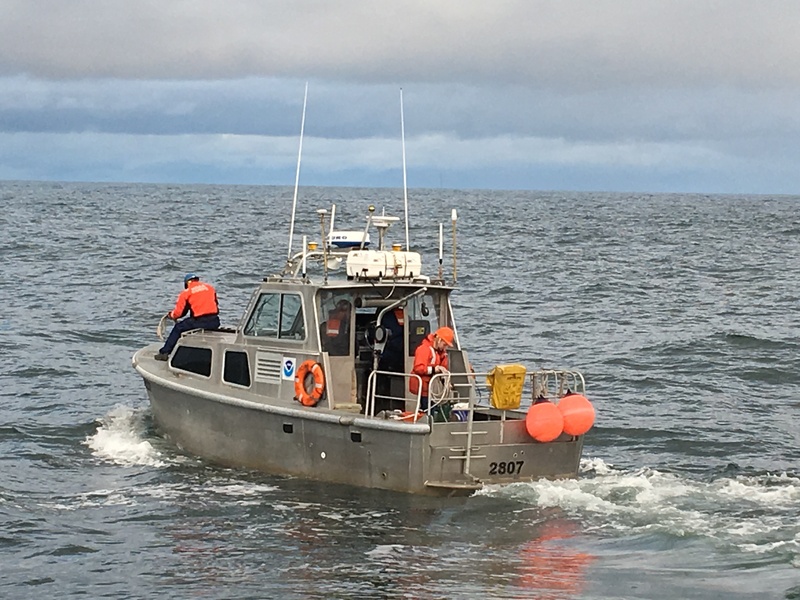 On this leg of the trip during our transit back to Kodiak Island, we stopped by Nome, Alaska, to pick up a scientist from NOAA’s Pacific Marine Environmental Lab PMEL office. 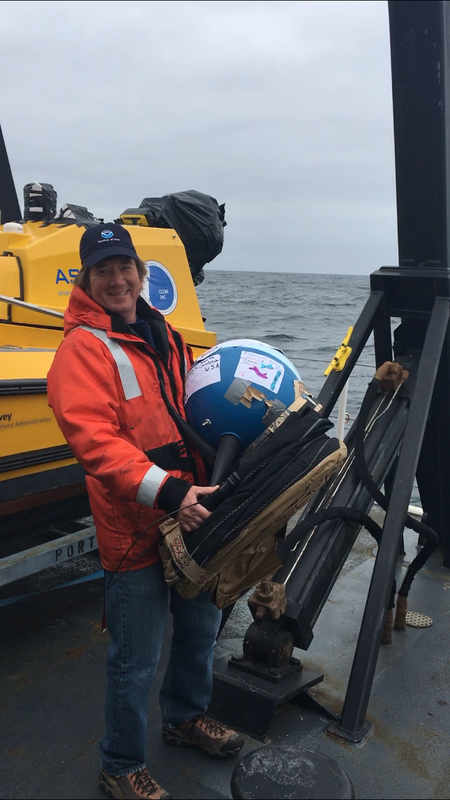 One of their research buoys separated from its mooring and went adrift in the Bering Sea (it drifted over 100 miles before we were able to catch up to it. The Fairweather was dispatched to collect and store the buoy aboard, after which it will eventually be returned to PMEL’s lab in Seattle Washington. The place with the most noise is definitely the engine room. Here, two sixteen piston engines built by General Motors powers the ship; the same engine power in one train engine ! It is extremely difficult to navigate in the engine room as there is so many valves, pipes, pumps, switches and wires. 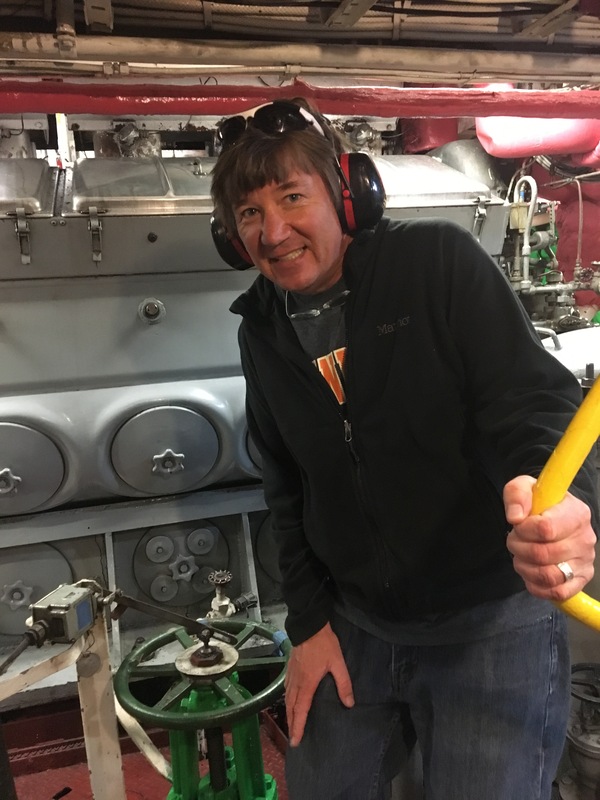 Did I mention that it is very warm in the room; according to the chief engineer, Tommy, to maintain a healthy engine is to ensure that the engine is constantly warm even during times when the ship is docked. 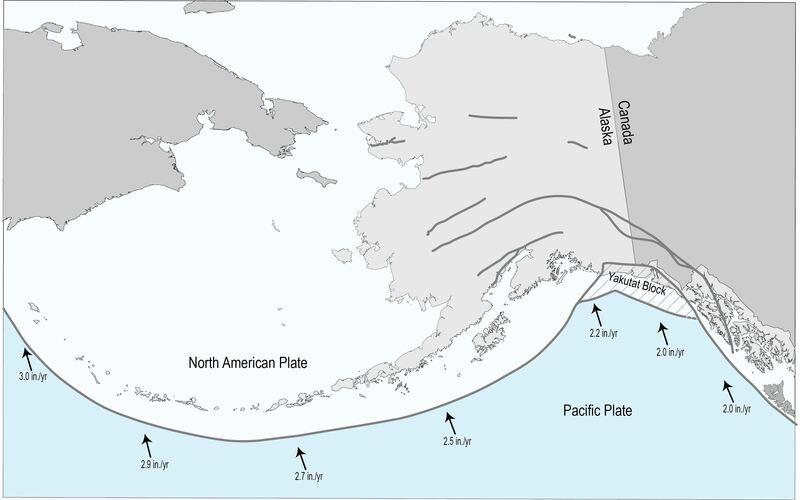 The Aleutian Islands are a product of a subduction zone between the North American and the Pacific Plate and known as the Aleutian Arc. Along this boundary, the Pacific Plate is being subducted underneath the North American Plate due to the difference in density. As a result, the plate heats up, melts and forms volcanoes. In this case the islands are classified as volcanic arcs. As a result of this collision, along the boundary the Aleutian Trench was formed and the deepest section measures 25,663 ft! For comparison purposes, the deepest point in the ocean is located in the Mariana’s Trench at 36,070 feet (6.8 miles)! 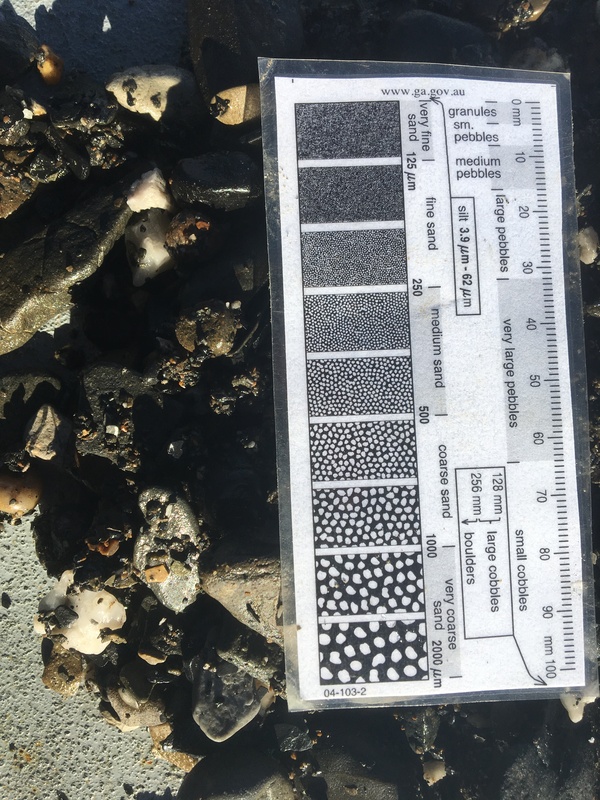 Through the use of radioisotopic dating of basalt rocks throughout the Aleutians, geologists have concluded the formation of the island chain occurred 35 million years ago. (USGS). Today, there are 14 volcanic islands and an additional 55 smaller islands making up the island chain. On the map above, the Aleutian Islands appear small. However, they extend an area of 6,821 sq mi and extend out to 1,200 miles! In comparison, North Carolina from the westernmost point to the Outer Banks is 560 miles, half of the Aleutian Islands. It takes roughly ten hours to drive from Murphy NC (western NC) to the Outer Banks of North Carolina. Since this region of the North American plate and the Pacific Plate are both oceanic plates, Island Arcs are formed. This is the same classification as the Bahamas, located southeast of Florida. The image above depicts a cross section of the geological forces that shaped the Aleutian Islands. 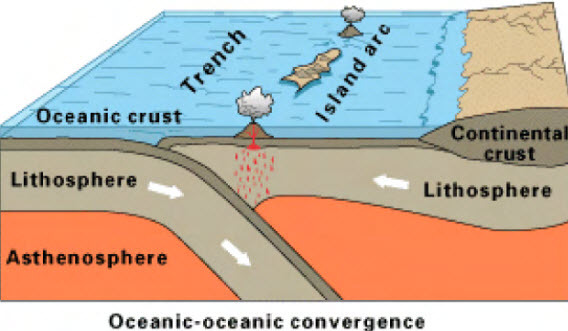 As the two plates collide, the oceanic crust is subducted under the lithosphere further offshore thus generating the island arcs. Unlike the west coasts of Washington, Oregon and California, there is an oceanic/continental collision of plates resulting in the formation of volcanoes further on the continental crust, hundreds of miles inland. Examples are Mount Rainier, Mount Hood, and Mount St. Helen’s which erupted in 1980. Alpine Glaciers are prevalent throughout the mountainous region of Alaska. 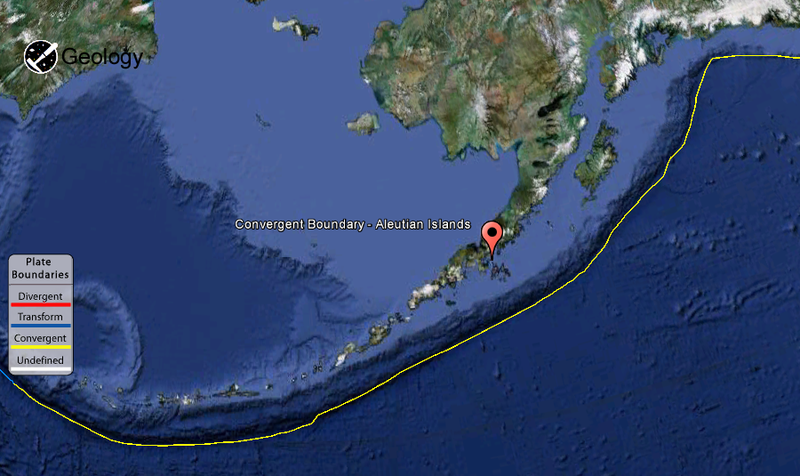 What about the Aleutians Islands? Today there are a few small alpine glaciers existing on Aleutian Islands. Alpine glacier on the Attu Island is one example, which is the western most island. One truth about being at sea is don’t trust the wall, floor or ceiling. Sometimes, the wall will become the floor or the ceiling will become the wall 🙂 Lately, the seas have become this ongoing amusement park ride. 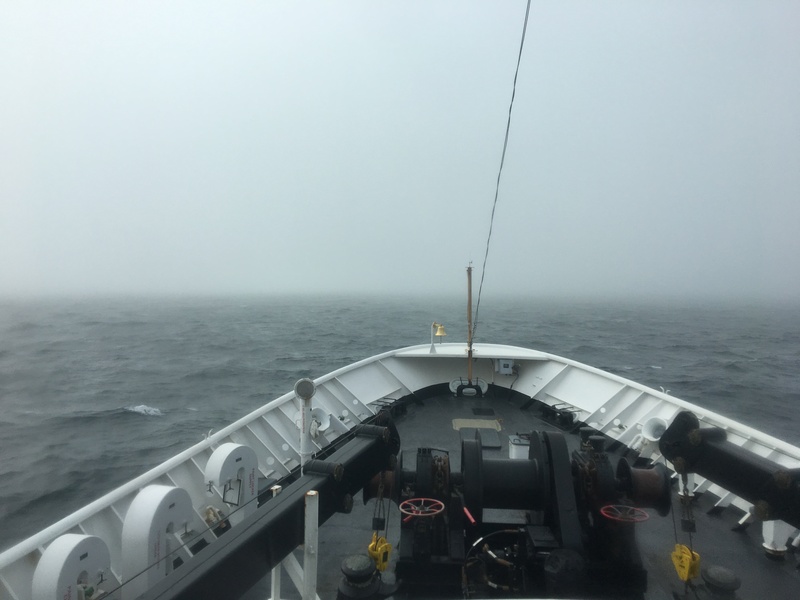 Although the weather has been a bit rough, data collection continues with the ship. The weather outside is more reflective of fall and winter back in North Carolina, though we have not seen any snow flakes. After surfing the waves yesterday while collecting data, today the hydrographers are processing data collected over the past few days. Yesterday was whale day! Early afternoon, humpbacks were spotted from the port side of the ship (left side). As the afternoon went on, humpbacks were spotted all around the Fairweather, at distances of 0.5 miles to 5 miles. Humpbacks are considered the “Clowns of the Seas” according to many marine biologists. 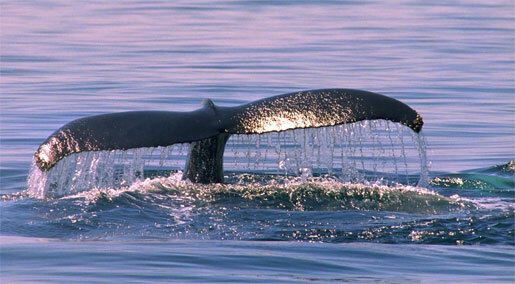 Identifying whales can be tricky especially if they are distances greater than a few miles. Humpbacks are famous for breaching the water and putting on a show, Yesterday we did not witness this behavior, however they were showing off their beautiful flukes. Question of the Day: Which whale species, when surfacing, generates a v shape blow? It takes a lot of personnel to ensure a successful mission. There are over forty personnel onboard this ship. During the past week, I have had opportunities to get to know them. How did you first get involved in NOAA? I was in the Coast Guard Reserves for eight years with some active time and trying to go back for active duty. While working in Silver Spring, MD working as an industrial hygienist for an engineering company, I walked by NOAA Administration and inquired about jobs, applied for NOAA Corps and was accepted into training at the Coast Guard academy in 2012. Processed out of Coast Guard into NOAA Corps as an Officer in Training. What is your job on board the Fairweather? I love being on the water and love driving the ship, making a 200-ton vessel do what you want by using the wind and seas, and navigating around other ships. 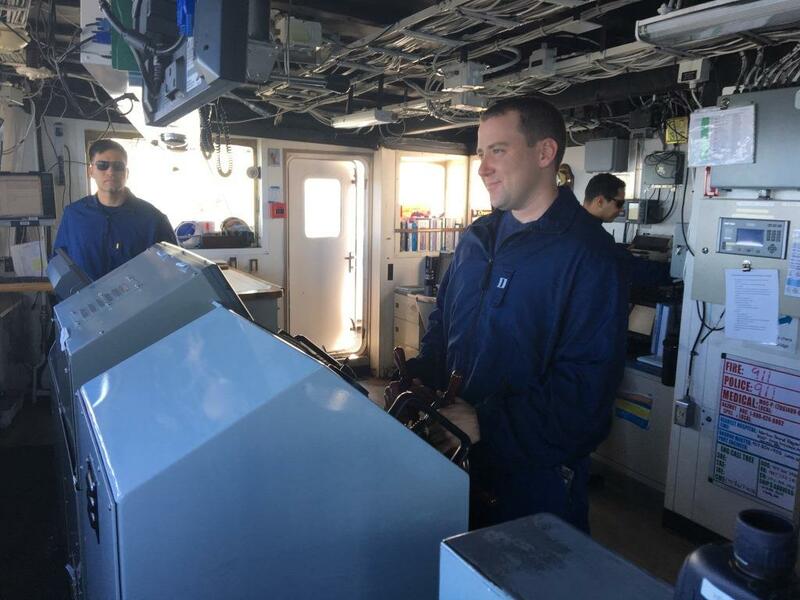 Most time is now spent in operations, training for what the ship needs to being doing with its time and funding, keeping us on the ship’s mission, which is surveying. How long have you been on board? When you were in high school did you have any vision of working at sea? No, I attended Assumption College and graduated with degree in global and environmental studies. It was tough finding a job with that degree, the only types of jobs with that degree is being a foreign officer . What do you enjoy most abut living on board? It makes a lot things convenient, commute to work is a walk upstairs, gym is down the stairs and meals are cooked and you have no dishes to clean. Everything you need is on board. Being able to explore the mountains and wild life in Juneau while the ship was under repair is another bonus. Being far from my family who are in Rhode Island with two adopted kids. Which other NOAA ships have your served? NOAA Ship Thomas Jefferson, an east coast hydrographic survey from 2013 -2015 as an ensign. 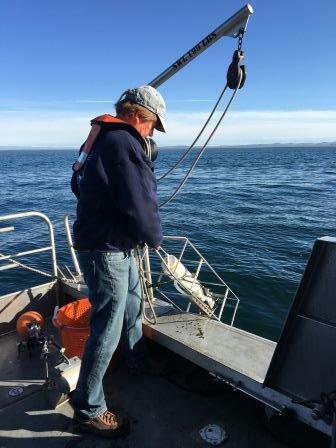 Spent 3 years on land as a CO-OPS handled tide gauge stations and operated small boats and traveled 4 weeks at a time for tide gauge maintenance along east coast team. Locations included Great Lakes and Puerto Rico. Where do you see yourself in NOAA in the future? Finishing up land assignment in Silver Spring Maryland and going out as an XO on a fisheries vessel in the Northeast such as NOAA Ship Henry B. Bigelow. Where did you attend college and what was your degree in? Emory University in Atlanta, Georgia. BA in Environmental Science. Originally from the Cayman Islands and lived in San Francisco for ten years. How did you get involved with NOAA? Found out through scientific papers and knew I wanted to work with maps and applied science. I have been working aboard the Fairweather for five months. San Francisco where my dad resides. It changes a lot depending on what is currently occurring. Six hour shifts on six hours off it simply depends on what is occurring in a day. While the boat launches are collecting data you are reviewing information and then process the data when it returns. What do you enjoy most about being at sea? Everything, love being on the water, that has a lot to do with growing up near the ocean. Every time I step outside on deck, it never ceases to amaze me with the beauty. What are some challenges with ship life? Living in close proximity with forty people living in close quarters. 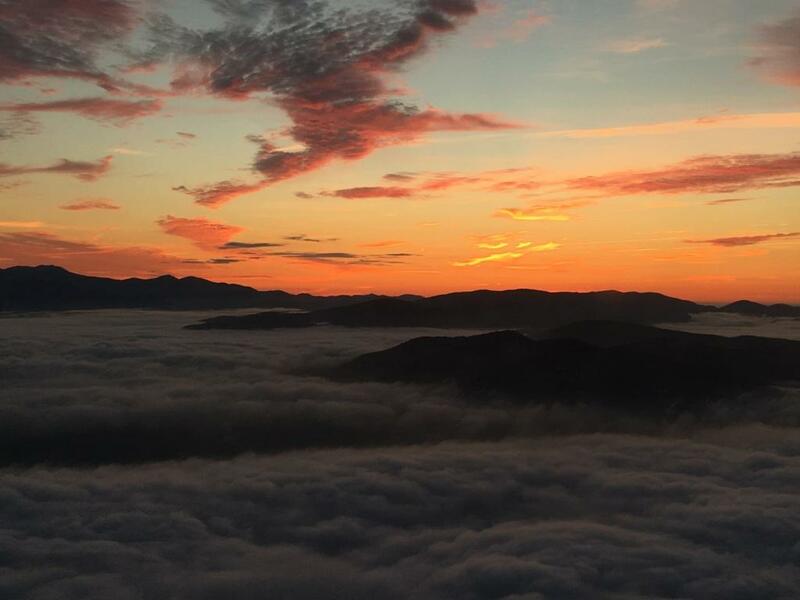 What is your favorite place you have visited while working for NOAA? Traveling through the Aleutian Islands. I still felt we were out far in the ocean with these beautiful islands. Do you want to stay in the Alaskan region? Yes, I have been wanting to traveling around Alaska since I was in high school. 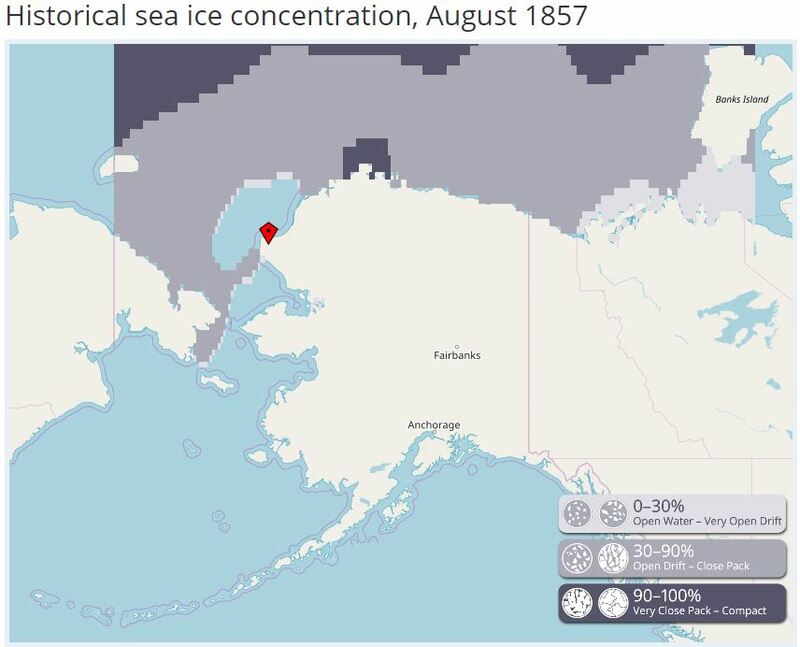 When I originally applied for NOAA, it did not specify Alaska. What do you enjoy doing while you are off the ship, off duty? It depends where the ship is located, hiking and fishing is what I enjoy most. Enjoy meeting and getting to know the local people at different ports. When returning to these ports, it is nice to get together with them and go hiking. Oversight of all the data, including the quality control and training new personnel. I saw a job online and applied for it, always wanted to work for NOAA. How many ships have you worked? Have worked on board the Fairweather for three years. What is your favorite place you have visited while on board? Yakutat, near Juneau. There is an incredible glacier there, one of the only advancing glaciers in south east Alaska. There are eighteen thousand foot mountains in this region. It is also home to the northern most surf shop. You enjoy surfing in Alaska. What do you enjoy the most about living on a ship? I enjoy visiting all these remote places that few people get to see. For instance seeing the sun never setting and going to remote islands to set up remote GPS base stations. What is your advice for anyone interested in cartography or marine biology? Attend Cape Fear Community College, Wilmington, North Carolina. As mentioned earlier, they have a great employment success rate of 95%. Start interning / volunteering as soon as you can. The community college also has a good research vessel with lots of hands on training. I traveled on two cruises, one to Baltimore and one to Bahamas. Each cruise has a different focus such as fish identification, mapping, bottom profiling and navigation. Grew up in Federal Way, Washington and moved to Gig Harbor, Washington, after high school to attend college. AA degree from Pierce College, Lakewood, Washington. Then attended Seattle Maritime Academy with a focus of Engineering. What is your primary role on the ship? Maintain and repair equipment on engines and clean air filters for ships air supply and staterooms, and oil changes on our generators. Also, work on a lot of special projects on board with the engineering team. How did you you get involved with NOAA? I heard about it during maritime school and my Port Captain had worked for NOAA and heard good things about it and then applied. They called me back for an interview over the phone and then sent me to Newport Oregon for a pre-employment physical. Then traveled to Norfolk Virginia for orientation. What do you do while you are off duty? I love to write and passionate about stories and writing books. First I start by brainstorming ideas from the places I have gone to and the experiences I have and the people I meet. It helps for plot and settings. This job helps me with that as we travel all over the northwest region. In one of my books I used my experience seeing glaciers and used that as an awesome setting. The types of books I write are science fiction, mystery and adventure. I have over twenty books that have been published and a series of books entitled Katrina the Angel. My newest one, Natalie and the Search for Atlantis, is a Science Fiction which is the ninth one in the “Katrina the Angel” series. It is my most proud book that I have written and the longest. Writing makes me happy and hope one day to make it a career. What do you enjoy the most about being at sea? What I like most is the places we have gone to such as traveling around Alaska with a great crew. Juneau, Alaska, is my favorite. It has great people and everything is within walking distance. There are many places to go hiking and places that have Karaoke. If someone wants to go out and buy one of your novels where can they purchase one? What do you find most challenging about being on board the ship? Do you have any plans as to working on another NOAA ship? How did you first get involved in the NOAA Corps? I was on vacation in North Carolina and saw a job posting regarding the NOAA Corps. What are the requirements for getting accepted into the NOAA Corps? You need a four year degree and they like to see experience in marine science or physical science preferably and being well rounded. There is a physical and medical screening pretty much the same as the military. My main responsibility is to drive and safely navigate the ship and support its mission. Other collateral duties include, damage control, small boat officer assist with ship fleet inspection and inventory management on the ship. Included with this is other administrative paper work and tasks. I really like how dynamic, challenging and a lot of responsibility. and I love the challenging work environment and how I continually learn new skills. I have been on this ship for two months. During these two months, what is the most amazing view you have seen? The transition through the Aleutian Islands, the scenery there includes snow covered volcanoes, intense scenery of jagged cliffs. Saw lots of whales, puffins and other sea birds. What is some of the challenges with working on a ship? There is constant distractions and its such a dynamic environment. Plans are constantly changing and you have to adapt and get the work done. Being away from my wife has been challenging and I will see her in December for three weeks. What place have you visited while serving the ship that you enjoyed the most? I enjoyed Juneau, hiking the mountain and snow fields. Visited the Mendenhall Glacier and enjoyed fishing. We caught Pinks and Chum which are both types of Salmon. I have now been at sea for over one week. The weather for the most part has been remarkable, sunshine. Last night we sailed into a sheltered area south of Point Hope, Kotzebue Sound, as the remnants of a tropical storm spun by. The wind gusts were recorded at 30 knots and the seas peaked around 8 feet. The Fairweather handled the rough seas well and rocked me to sleep. We are sailing back to the Point Hope area to conduct more surveying during this remainder of this week. At Point Hope, the sun rises at 6:20 am and sets at 12:04 am. As each day passes, the daylight is getting shorter by 10 minutes as we head into fall. On December 21st, the sun will be directly overhead at 21 degrees south Latitude and marks is the winter solstice. Using the image below, notice that the sun is shining a 90 degree angle directly above the Earth at 21 degrees south latitude. Locate the Arctic Circle and imagine the globe spinning, what do you see or not see at the Arctic Circle during the Winter Solstice? 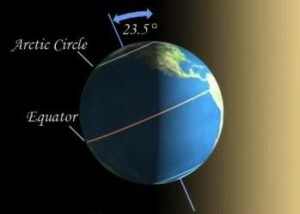 Diagram of Earth at Winter Solstice. Image from thenorthwestforager.com. Question of the Day How much sunlight will Point Hope receive December 21st during the Winter Solstice? 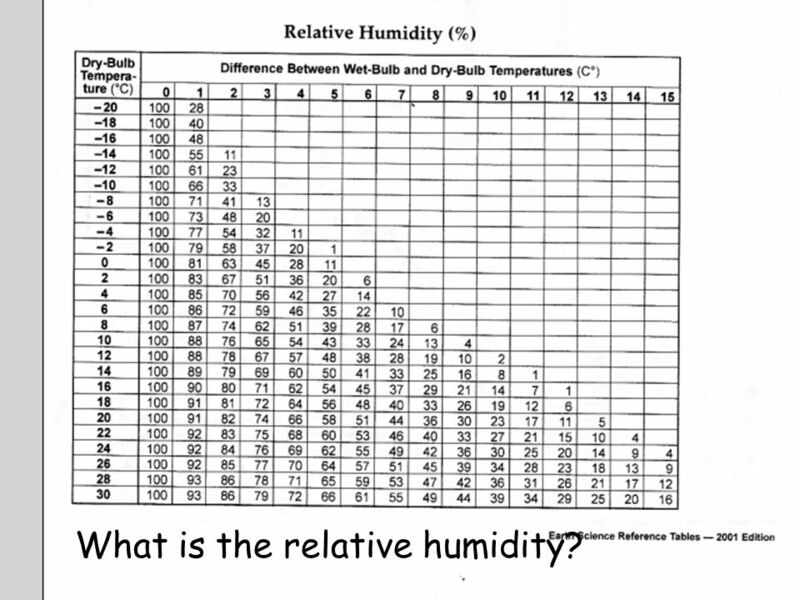 Answer from yesterday Answer is 74% relative humidity. Relative humidity measures how much water vapor the atmosphere can hold at a specific temperature. Relative humidity is really a measurement of comfort and that is why meteorologist use this especially during the summer months. At warmer temperatures, the atmosphere can hold large amounts of water vapor. In the south, we always relate high humidity with hot temperatures. As the atmosphere becomes saturated with water vapor, water will cling to the nearest object, you; thus it becomes uncomfortable. However, at cooler temperatures, the atmosphere cannot hold that much water vapor, so the atmosphere can reach 100%, but it is comfortable as there simply is not a lot of water in the atmosphere. The focus of the NOAA ship Fairweather is to generate and update existing maps of the ocean floor called hydrography. 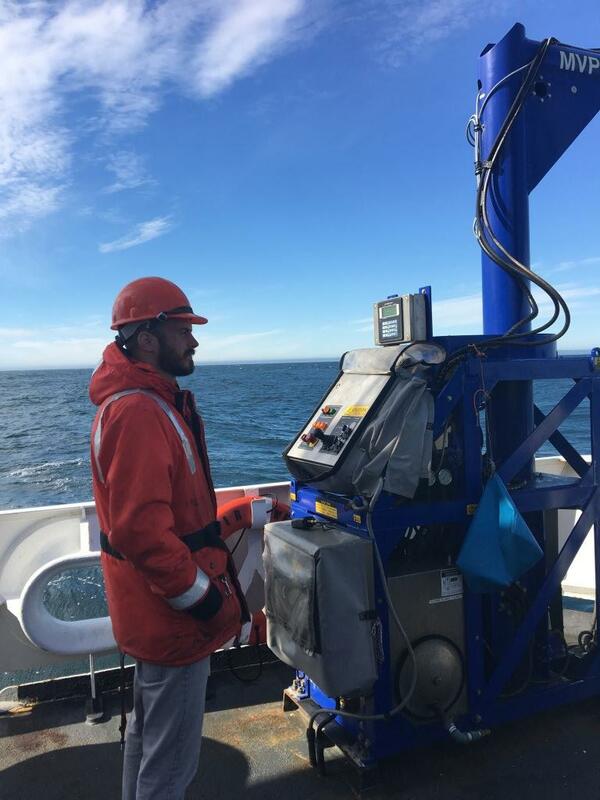 The ship is outfitted with state of the art mapping equipment which uses single and multibeam sonar in capturing the physical topography of the ocean floor (more on this in a future blog). 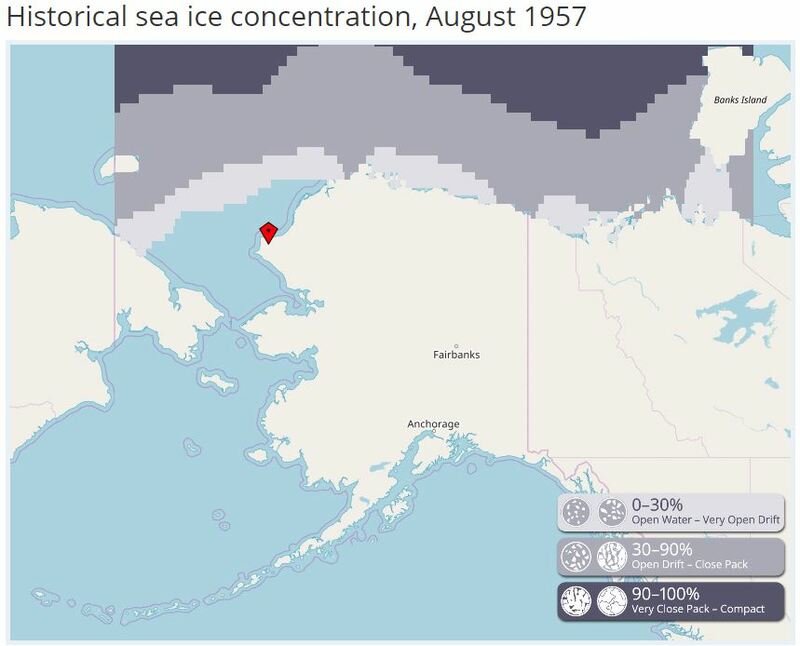 The region we are mapping is located off the coast of Point Hope in north west Alaska. 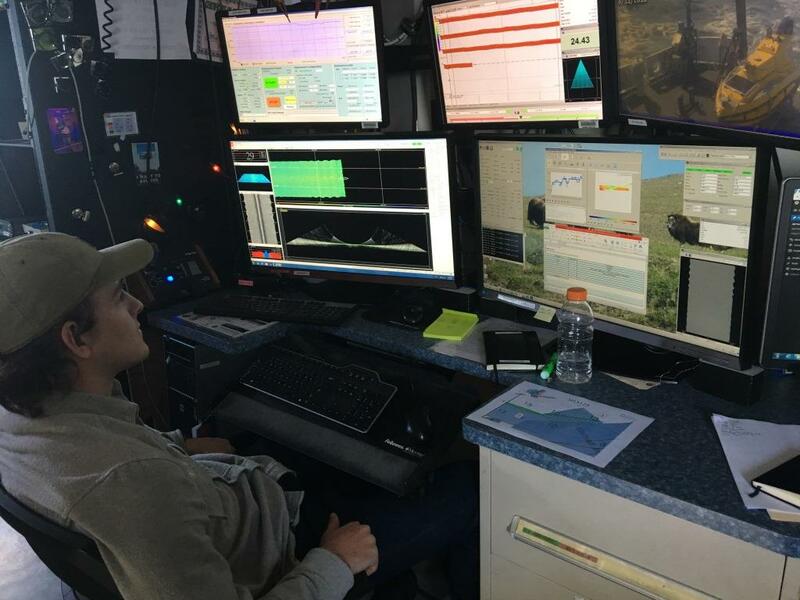 It takes an amazing amount of technology especially navigational tools located in the bridge to navigate the ship within this challenging region called the Chukchi Sea. There are two types of radar on the bridge used to navigate the ship using different radio frequencies, the X band and S band. The X Band radar generates radio waves with 3 cm and 9 GHz, respectively. The radar is positioned high above the bridge and has the ability to pick up ships up to 40 miles in the distance. 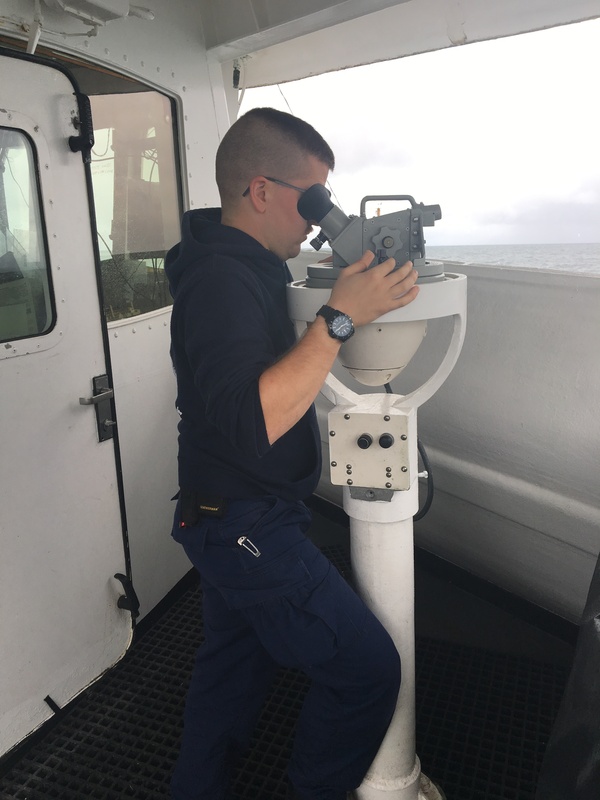 During the best weather conditions, officers on the bridge can see the horizon at a distance of 6 miles with the highest powered binoculars and make out other vessels out to about 14 miles. This radar extends the visual range of officers especially identifying ships that are not visible through the use of binoculars. 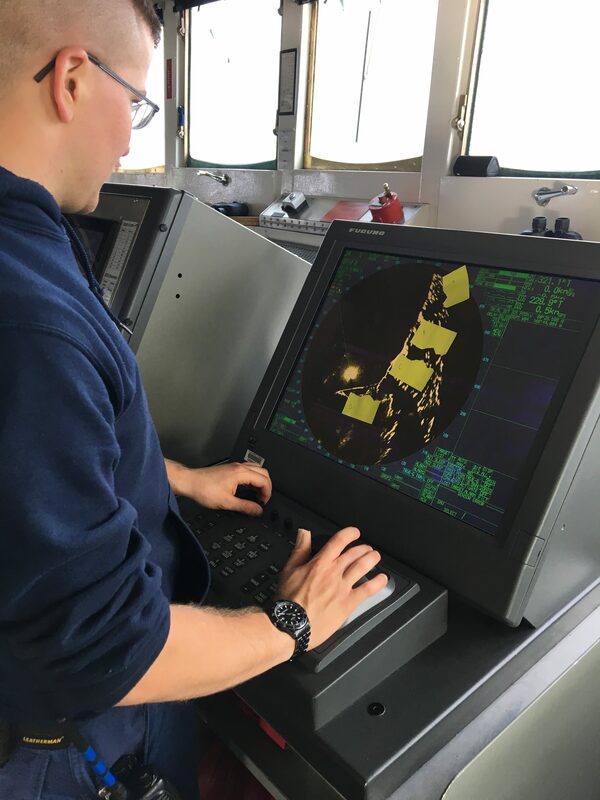 This radar is useful for detecting smaller objects such as small boats in the vicinity of the ship, due to its ability to better resolve smaller objects. The S Band radar generates radio waves with 9cm and 3 GHz … for context, a microwave oven operates at around 2.5 GHz; a car radio receives at 0.1 GHz (though most people think in MHz… e.g. “You’re listening to The Mountain on 105.9 (MHz)”… the lower frequency of the radio means it’s even less affected by rain and can travel even farther – both good things if you’re running a radio station). This type sound wave have longer distances between each crest. As a result, the sound wave can better track larger objects than the X band and objects at greater distances. In addition, this radar can be used to detect ships through walls of rain. This radar is used by weather forecasters to track types of precipitation, direction and severity and to identify possible rotations that could develop tornado. Another unique property of this radar is its ability to track precipitation on the other side of mountains. In this region of Point Hope, the Brooks Range is visible to the east and knowing the precipitation and direction is important for planning ship operations. Another vital role of these radars is to track current position of the ship when anchored. By using four known coordinates of physical objects on land, in our case, the Brooks Range, located to our east, and known peninsulas are targeted. Officers will use the alidade (and compass rose) located outside the bridge to get their bearings and confirm the ships geographic coordinates. This information reveals whether the ship’s anchor is being dragged. 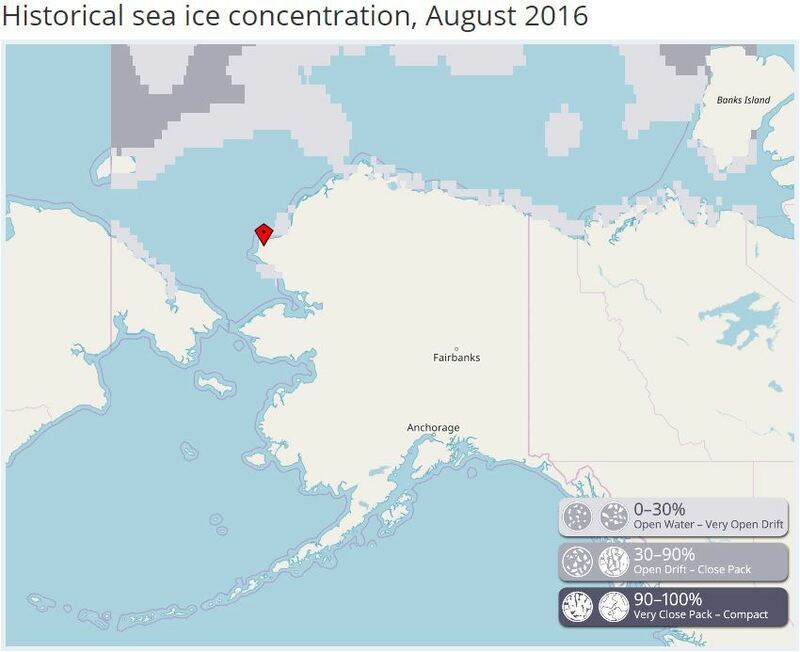 Geography – Point Hope is located just above the Arctic Circle; why is NOAA mapping this region? The sea ice in this region of Point Hope continues to disappear as a reflection of increased global temperatures. This has generated an opportunity for merchant ships to sail north of Canada instead of using the Panama Canal. 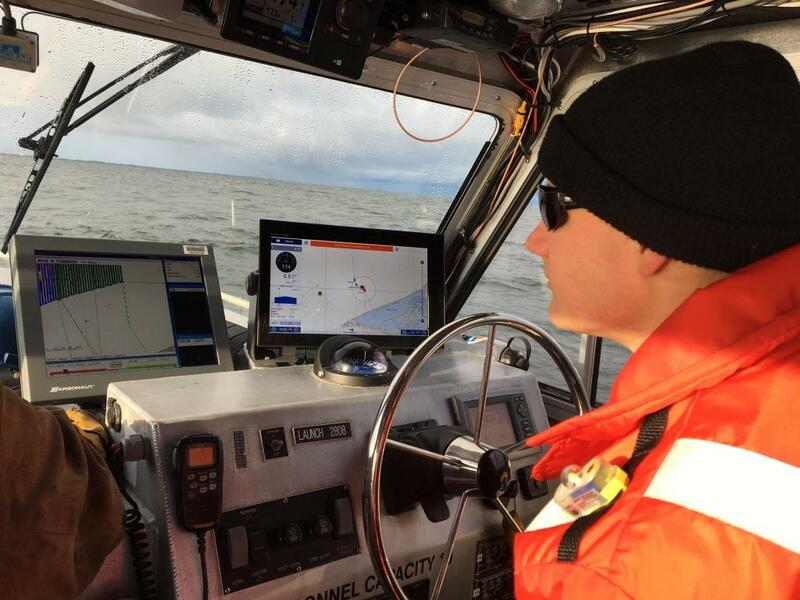 The mapping of the ocean floor will provide mariners accurate maps resulting in safer passage. My journey began at 6 am as my plane from the Asheville airport departed. Traveling over Alaska viewing the Rockies and glaciers from the window has been inspiring and reveals how big Alaska really is. As soon as I landed in Nome, Alaska, around 1 am eastern time, I was reminded again how important it is to be flexible when participating in any NOAA research. After meeting up with the junior officer at the airport, he informed me that the ship is leaving in two hours due to an approaching storm. Scientists conducting research on board a ship at sea are always at the mercy of mother nature. Everyone on board NOAA’s hydrographic ship Fairweather has been exceptionally welcoming and nice which made my transition to life at sea smooth. 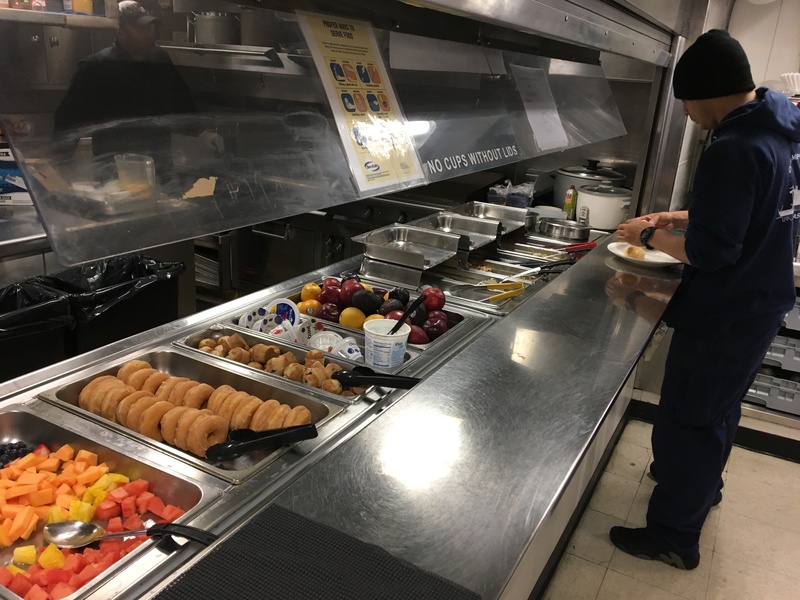 The tradition of excellent food on board NOAA ships continues!! I am looking forward to learning as much as I can during this three week adventure and bring back inspiring lessons and labs to the classroom. It is always my hope and vision to provide real world science in action to excite and encourage our students to explore and possible explore careers in science.